The history of the penny of Great Britain and the United Kingdom from 1714 to 1901, the period in which the House of Hanover reigned, saw the transformation of the penny from a little-used small silver coin to the bronze piece recognisable to modern-day Britons. All bear the portrait of the monarch on the obverse; copper and bronze pennies have a depiction of Britannia, the female personification of Britain, on the reverse. 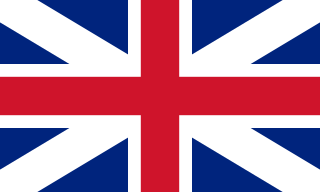 The Kingdom of Great Britain, officially called simply Great Britain, was a sovereign state in western Europe from 1 May 1707 to 31 December 1800. The state came into being following the Treaty of Union in 1706, ratified by the Acts of Union 1707, which united the kingdoms of England and Scotland to form a single kingdom encompassing the whole island of Great Britain and its outlying islands, with the exception of the Isle of Man and the Channel Islands. The unitary state was governed by a single parliament and government that was based in Westminster. The former kingdoms had been in personal union since James VI of Scotland became King of England and King of Ireland in 1603 following the death of Elizabeth I, bringing about the "Union of the Crowns". After the accession of George I to the throne of Great Britain in 1714, the kingdom was in a personal union with the Electorate of Hanover. 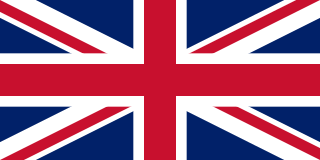 The United Kingdom (UK), officially the United Kingdom of Great Britain and Northern Ireland but more commonly known as Britain, is a sovereign country lying off the north-western coast of the European mainland. The United Kingdom includes the island of Great Britain, the north-eastern part of the island of Ireland and many smaller islands. Northern Ireland is the only part of the United Kingdom that shares a land border with another sovereign state, the Republic of Ireland. Apart from this land border, the United Kingdom is surrounded by the Atlantic Ocean, with the North Sea to the east, the English Channel to the south and the Celtic Sea to the south-west, giving it the 12th-longest coastline in the world. The Irish Sea lies between Great Britain and Ireland. With an area of 242,500 square kilometres (93,600 sq mi), the United Kingdom is the 78th-largest sovereign state in the world. It is also the 22nd-most populous country, with an estimated 66.0 million inhabitants in 2017. 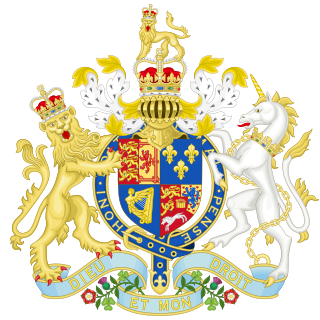 The House of Hanover, whose members are known as Hanoverians, is a German royal house that ruled Hanover, Great Britain, and Ireland at various times during the 17th through 20th centuries. The house originated in 1635 as a cadet branch of the House of Brunswick-Lüneburg, growing in prestige until Hanover became an Electorate in 1692. George I became the first Hanoverian monarch of Great Britain and Ireland in 1714. At Victoria's death in 1901, the throne of the United Kingdom passed to her eldest son Edward VII, a member of the House of Saxe-Coburg and Gotha. The last reigning members of the House lost the Duchy of Brunswick in 1918 when Germany became a republic. During most of the 18th century, the penny was a small silver coin rarely seen in circulation, and that was principally struck to be used for Maundy money or other royal charity. Beginning in 1787, the chronic shortage of good money resulted in the wide circulation of private tokens, including large coppers valued at one penny. In 1797 industrialist Matthew Boulton gained a contract to produce official pennies at his Soho Mint in Birmingham; he struck millions of pennies over the next decade. After that, it was not until 1825 that pennies were struck again for circulation, and the copper penny continued to be issued until 1860. Conder tokens, also known as 18th-century provincial tokens, are a form of privately minted token coinage struck and used during the latter part of the 18th century and the early part of the 19th century in England, Anglesey and Wales, Scotland, and Ireland. Matthew Boulton was an English manufacturer and business partner of Scottish engineer James Watt. In the final quarter of the 18th century, the partnership installed hundreds of Boulton & Watt steam engines, which were a great advance on the state of the art, making possible the mechanisation of factories and mills. Boulton applied modern techniques to the minting of coins, striking millions of pieces for Britain and other countries, and supplying the Royal Mint with up-to-date equipment. Soho Mint was created by Matthew Boulton in 1788 in his Soho Manufactory in Handsworth, West Midlands, England. A mint was erected at the manufactory containing eight machines, to his own patent design, driven by steam engine, each capable of striking 70 to 84 coins per minute. By the late 1850s, the state of the copper coinage was deemed unsatisfactory, with quantities of worn oversized pieces, some dating from Boulton's day, still circulating. They were replaced by lighter bronze coins beginning in 1860; the "Bun penny", named for the hairstyle of Queen Victoria on it, was issued from then until 1894. The final years of Victoria's reign saw the "Veiled head" or "Old head" pennies, which were coined from 1895 until her death in 1901. Victoria was Queen of the United Kingdom of Great Britain and Ireland from 20 June 1837 until her death. 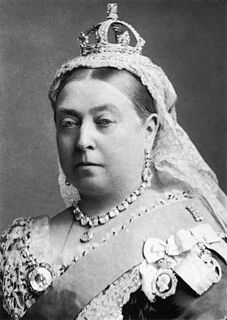 On 1 May 1876, she adopted the additional title of Empress of India. 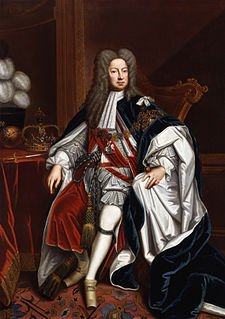 George I was King of Great Britain and Ireland from 1 August 1714 and ruler of the Duchy and Electorate of Brunswick-Lüneburg (Hanover) in the Holy Roman Empire from 1698 until his death in 1727. The English penny, originally a coin of 1.3 to 1.5 grams pure silver, was introduced around the year 785 by King Offa of Mercia. These coins were similar in size and weight to the continental deniers of the period and to the Anglo-Saxon sceats which had preceded it. Sir Isaac Newton was an English mathematician, physicist, astronomer, theologian, and author who is widely recognised as one of the most influential scientists of all time, and a key figure in the scientific revolution. His book Philosophiæ Naturalis Principia Mathematica, first published in 1687, laid the foundations of classical mechanics. Newton also made seminal contributions to optics, and shares credit with Gottfried Wilhelm Leibniz for developing the infinitesimal calculus. John Croker, born in Saxony and known in his youth as Johann Crocker, was a master jeweller who migrated to London, where he became a medallist and engraved dies for English and later British coins and medals. William III, also widely known as William of Orange, was sovereign Prince of Orange from birth, Stadtholder of Holland, Zeeland, Utrecht, Gelderland and Overijssel in the Dutch Republic from 1672 and King of England, Ireland and Scotland from 1689 until his death in 1702. As King of Scotland, he is known as William II. He is sometimes informally known in Northern Ireland and Scotland as "King Billy". Anne was the Queen of England, Scotland and Ireland between 8 March 1702 and 1 May 1707. On 1 May 1707, under the Acts of Union, two of her realms, the kingdoms of England and Scotland, united as a single sovereign state known as Great Britain. She continued to reign as Queen of Great Britain and Ireland until her death in 1714. The groat is the traditional name of a long-defunct English and Irish silver coin worth four pence, and also a Scottish coin which was originally worth fourpence, with later issues being valued at eightpence and one shilling. The Calendar Act 1750 (c.23) was an Act of the Parliament of Great Britain. The Act had two parts: first, it reformed the calendar of England and the British Dominions so that the new legal year began on 1 January rather than 25 March ; and, second, Great Britain and its Dominions adopted the Gregorian calendar, as already used in most of western Europe. Maundy Thursday is the Christian holy day falling on the Thursday before Easter. It commemorates the foot washing (Maundy) and Last Supper of Jesus Christ with the Apostles, as described in the canonical gospels. It is the fifth day of Holy Week, preceded by Holy Wednesday and followed by Good Friday. "Maun-" is from Old Norse, present of munu meaning shall or will; akin to Old English gemynd meaning mind. For the history of the silver penny from the 19th century onward, see Maundy money. These penny (centre) and halfpenny tokens circulated during the coinage emergencies of the late 18th and early 19th century. ↑ Georgius Dei Gratia/Magnae Britanniae Franciae et Hiberniae Rex, or George by the Grace of God/King of Great Britain, France and Ireland. The British throne's claim to France was at this point purely historic. 1 2 Craig, pp. 211–214. 1 2 Lobel, p. 583. 1 2 Selgin, pp. 163–164. ↑ Selgin, pp. 163–166, 178, 189. 1 2 Lobel, pp. 583–584. ↑ Dyer & Gaspar, pp. 455–459. ↑ Dyer & Gaspar, p. 488. 1 2 Lobel, p. 584. ↑ Crellin, Andrew. "The 1827 Penny From Great Britain - Unique in the Australian Colonial Series". Sterling & Currency. Archived from the original on 2017-08-06. Retrieved 18 July 2017. ↑ Dyer & Gaspar, p. 503. ↑ Dyer & Gaspar, pp. 508–509. ↑ Dyer & Gaspar, p. 509. 1 2 Linecar, p. 108. ↑ Dyer & Gaspar, pp. 509–510. ↑ Dyer & Gaspar, p. 510. 1 2 3 Dyer & Gaspar, pp. 510–511. ↑ Dyer & Gaspar, p. 511. ↑ Dyer & Gaspar, p. 525. ↑ Lobel, pp. 586–587, 681. 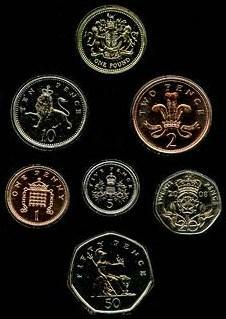 The standard circulating coinage of the United Kingdom is denominated in pounds sterling, and, since the introduction of the two-pound coin in 1994, ranges in value from one penny to two pounds. Since decimalisation, on 15 February 1971, the pound has been divided into 100 (new) pence. From the 16th century until decimalisation, the pound was divided into 20 shillings, each of 12 (old) pence. British coins are minted by the Royal Mint in Llantrisant, Wales. The Royal Mint also commissions the coins' designs. The British half farthing coin, usually simply known as a half farthing, was a unit of currency equaling 1/1,920 of a pound sterling, or one eighth of a penny. It was minted in copper for use in Ceylon, but in 1842 they were declared legal tender in the United Kingdom. Two different obverses were used. Like all British coinage, it bore the portrait of the monarch on the obverse. The third farthing was a British coin which was produced in various years between 1827 and 1913. The History of the English penny from 1485 to 1603 covers the period of the Tudor dynasty. The history of the English penny from 1603 to 1707 covers the period of the House of Stuart, up to the Acts of Union of 1707 which brought about the Union of the Kingdom of England with the Kingdom of Scotland. The British penny, a large, pre-decimal coin continuing the series of pennies that began about the year 700, was struck intermittently during the 20th century until its withdrawal after 1970. Throughout the period 1901 to 1970, the obverse of the bronze coin depicted the monarch who was reigning at the start of the year. The reverse featured an image of Britannia seated with shield, trident, and helm, originally created by Leonard Charles Wyon and based on an earlier design for the penny by his father William Wyon. The coins also were used in dominions and British colonies that had not issued their own coins. The British florin, or two shilling coin, was issued from 1849 until 1967, with a final issue for collectors dated 1970. Valued at one tenth of a pound, it was the last coin circulating immediately prior to decimalisation to be demonetised, in 1993, having for a quarter of a century circulated alongside the ten pence piece, identical in specifications and value. The British pre-decimal halfpenny coin, usually simply known as a halfpenny, historically occasionally also as the obol, was a unit of currency that equalled half of a penny or ​1⁄480 of a pound sterling. Originally the halfpenny was minted in copper, but after 1860 it was minted in bronze. It ceased to be legal tender in 1969, in the run-up to decimalisation. The halfpenny featured two different designs on its reverse during its years in circulation. From 1672 until 1936 the image of Britannia appeared on the reverse, and from 1937 onwards the image of the Golden Hind appeared. Like all British coinage, it bore the portrait of the monarch on the obverse. The British farthing coin, from "fourthing", was a unit of currency of one quarter of a penny, or ​1⁄960 of a pound sterling. It was minted in bronze, and replaced the earlier copper farthings. It was used during the reign of six monarchs: Victoria, Edward VII, George V, Edward VIII, George VI and Elizabeth II, ceasing to be legal tender in 1960. It featured two different designs on its reverse during its 100 years in circulation: from 1860 until 1936, the image of Britannia; and from 1937 onwards, the image of a wren. Like all British coinage, it bore the portrait of the monarch on the obverse. The British threepence (3d) coin, usually simply known as a threepence or threepenny bit, was a unit of currency equaling one eightieth of a pound sterling, or three old pence sterling. It was used in the United Kingdom, and earlier in Great Britain and England. Similar denominations were later used throughout the British Empire, notably in Australia, New Zealand, and South Africa. The half guinea gold coin of the Kingdom of England and later of Great Britain was first produced in 1669, some years after the Guinea entered circulation. It was officially eliminated in the Great Recoinage of 1816, although, like the guinea, it was used in quoting prices until decimalisation. The British farthing was a British coin worth a quarter of an old penny. It ceased to be struck after 1956 and was demonetised from 1 January 1961. Canadian coinage is the coinage of Canada, produced by the Royal Canadian Mint and denominated in Canadian dollars ($) and the subunit of dollars, cents (¢). An effigy of the reigning monarch always appears on the obverse of all coins. There are standard images which appear on the reverse, but there are also commemorative and numismatic issues with different images on the reverse. The British halfpenny coin was worth 1/480th of a pound sterling. At first in its 700-year history it was made from silver but as the value of silver increased, the coin was made from base metals. It was finally abandoned in 1969 as part of the process of decimalising the British currency. "Halfpenny", colloquially written ha'penny, was pronounced HAY-pə-nee; "1 ½d" was spoken as a penny ha'penny or three ha'pence. The threepence or threepenny bit was a denomination of currency used by various jurisdictions in England, Ireland, Scotland and Wales, valued at 1/80 of a pound or ¼ of a shilling until decimalisation of the pound sterling and Irish pound in 1971. It was also used in some parts of the British Empire, notably Australia, New Zealand and South Africa. The pre-decimal penny (1d) was a coin worth 1/240 of a pound sterling. Its symbol was d, from the Roman denarius. It was a continuation of the earlier English penny, and in Scotland it had the same monetary value as one pre-1707 Scottish shilling. The penny was originally minted in silver, but from the late 18th century it was minted in copper, and then after 1860 in bronze. A farthing was a coin of the Kingdom of England worth one quarter of a penny, ​1⁄960 of a pound sterling. Such coins were first minted in England in silver in the 13th century, and continued to be used until the Kingdom of England was merged into the new Kingdom of Great Britain in 1707. The pre-decimal twopence (2d) was a coin worth one one-hundred-and-twentieth of a pound sterling, or two pence. It was a short-lived denomination, only being minted in 1797 by Matthew Boulton's Soho Mint. Craig, John (2010) . The Mint (paperback ed.). Cambridge, United Kingdom: Cambridge University Press. ISBN 978-0-521-17077-2. Doty, Richard (1998). The Soho Mint & the Industrialization of Money. London: National Museum of American History, Smithsonian Institution. ISBN 978-1-902040-03-5. Freeman, Michael J. (1985) . The Bronze Coinage of Great Britain (revised ed.). London: Barrie & Jenkins Ltd. ISBN 978-0-09-155240-4. Josset, Christopher Robert (1962). Money in Britain. London: Frederick Warne and Co Ltd. OCLC 923302099. Linecar, H.W.A. (1977). British Coin Designs and Designers. London: G. Bell & Sons Ltd. ISBN 978-0-7135-1931-0. Lobel, Richard, ed. (1999) . Coincraft's Standard Catalogue English & UK Coins 1066 to Date (5th ed.). London: Standard Catalogue Publishers Ltd. ISBN 978-0-9526228-8-8. Peck, C. Wilson (1960). English Copper, Tin and Bronze Coins in the British Museum 1558–1958. London: Trustees of the British Museum. OCLC 906173180. Robinson, Brian (1992). Silver Pennies & Linen Towels: The Story of the Royal Maundy. London: Spink & Sons Ltd. ISBN 978-0-907605-35-5. Seaby, Peter (1985). The Story of British Coinage. London: B. A. Seaby Ltd. ISBN 978-0-900652-74-5. Selgin, George (2011) . Good Money: Birmingham Button Makers, the Royal Mint, and the Beginnings of Modern Coinage, 1775–1821 (paperback ed.). Oakland, California: The Independent Institute. ISBN 978-1-59813-043-0. Skellern, Stephen (December 2013). "The Coinage of Edward VII, Part III". Coin News: 35–36. Spink & Son Ltd (2016). Coins of England and the United Kingdom, Pre-decimal Issues (52nd ed.). London: Spink & Son Ltd. ISBN 978-1-907427-98-5.